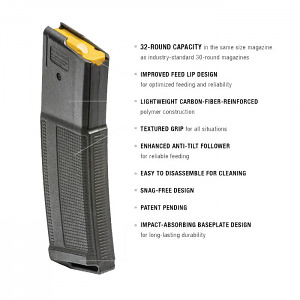 Built with the same high quality as their precision-made rifles, the Daniel Defense magazine features a 32RD capacity in the same overall size as a comparable 30RD magazine. Lightweight carbon-fiber-reinforced polymer construction, improved feed lip design, anti-tilt follower, impact absorbing baseplate, and a textured body for easy grip in all weather conditions. Made in the USA! exactly what I needed, Thanks!! !